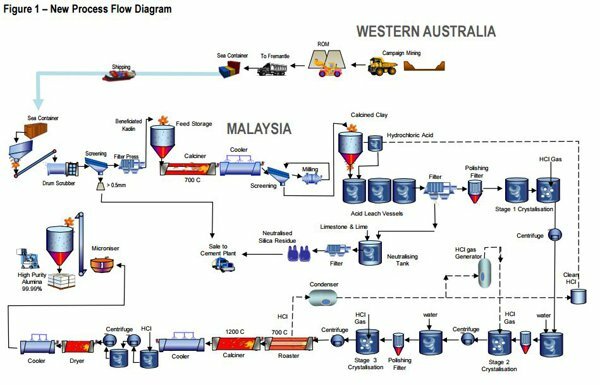 Altech Chemicals’ (ASX:ATC) kaolin beneficiation plant will now be in Malaysia instead of Australia after further studies identified it would reduce capital costs, just as it takes its plans to potential financiers. The high-purity alumina player told shareholders today that it had been tweaking its plan around the edges since it completed a bankable feasibility study on the project at the end of June. In that plan, ATC was to take kaolin clay from Meckering in WA, put it through a beneficiation plant on site to produce a dry kaolin product with 30% aluminium oxide. 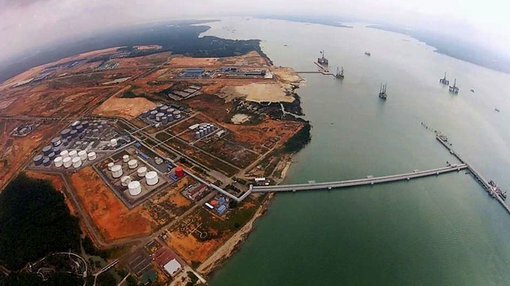 It would then be processed further at a processing plant in Johor, Malaysia. However, ATC has found that by putting the beneficiation plant in Malaysia it would simplify the process, despite needing to ship higher tonnages of raw kaolin clay from WA. Before it would have had to transport 18,5000 tonnes of dry beneficiated kaolin to Malaysia per year, but under the new plan it will need to ship 40,000/tpa of raw kaolin clay. The savings, ATC said, would come in reduced costs in Malaysia for the plant. It said the plant would be smaller, but be able to operate 24 hours a day instead of 12 hours, benefitting from cheaper energy costs by being located in a key industrial precinct in Malaysia. ATC will also save cash because a dryer, bagging unit, and supporting infrastructure will not be needed at the new plant. The raw kaolin will simply be bagged and sent to Malaysia without needing to be dried first. ATC is in the middle of trying to raise funding for the project, and managing director Iggy Tan said the changes would not affect the net present value of the project, but rather reduce capex and opex. “The impacts on project NPV will be minimal, however the simplification of the beneficiation flow sheet and the synergies of having all the major project infrastructure at one site and within one jurisdiction, Malaysia, will deliver both operating and project financing advantages,” he said. ATC is currently trying to sort out financing for the project, and recently piqued the curiosity of a “major German bank”. It inked a letter of intent with the bank, but the LOI will need ‘export credit insurance’ for the LOI to turn into a fully-fledged deal. Because the loan would essentially be an export loan, Euler Hermes, the German Export Credit Agency, would need to provide the cover. The funding would count as an export loan because German group M+W will be doing the engineering procurement and construction work on the project. However, a lowering of opex and possibly capex would reduce the amount ATC would need to seek from financiers. The company is aiming to mine a 65Mt JORC-compliant aluminous clay in WA which will be processed at a beneficiation plant on site, producing 25,000t of alumina-rich kaolin clay per year. It recently snagged a $3 million deal with Dana Shipping and Trading for the shipping company to access mining rights for the clay ATC doesn’t need. The clay will then be taken to a manufacturing plant in Malaysia with production capacity of 4000t per year, using its technology to turn the clay into a 99.99% pure HPA product. It also recently it signed up industrial giant Mitsubishi to act as a sales agent for its finished product, giving ATC an entry into the lucrative Japanese market.